GUI for Rogueware's "Freeholder" game - Freeholder is an information dense game of strategy and random chance. The creators were really going for an old school roguelike feel and wanted the pixels to boot. I strove to have all the relavant information easy to see and keep extranious details out. 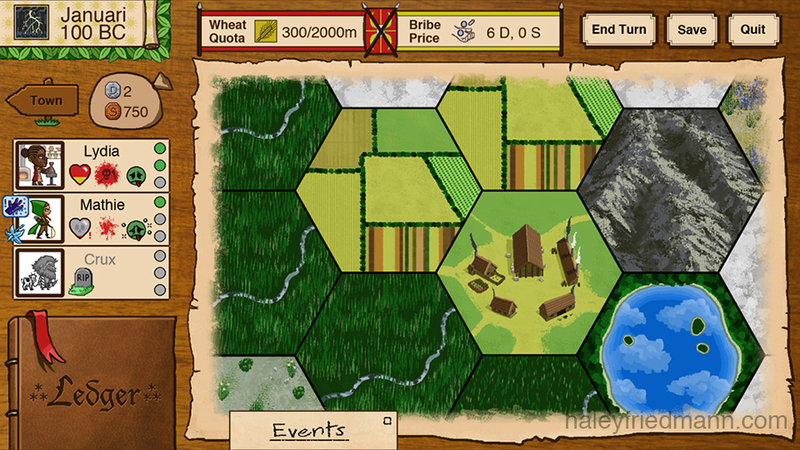 The Ledger in the lower left corner takes up a good chunk of real estate because it is the player's most valuable source of information as they play. It appears open before the player turned to the relevant page to act as a menu screen, or the player can bring it up themselves to view their inventory and character equipment, etc. 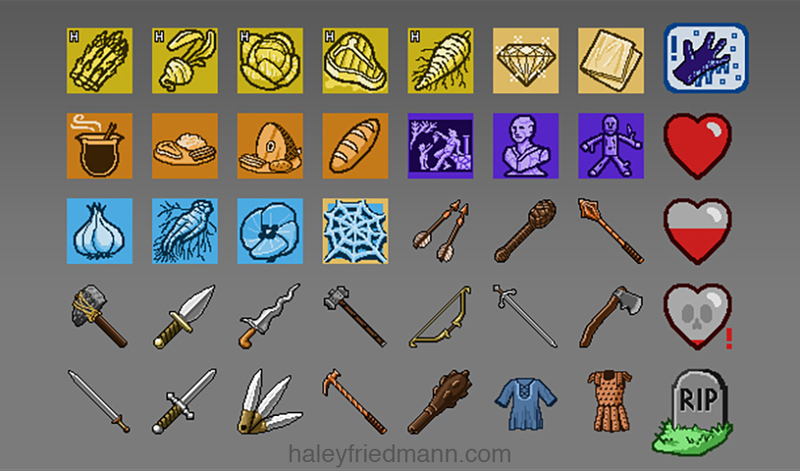 Various icons for Rogueware's "Freeholder" game - crafting items, food, weapons, clothes, health, and status. My favorite was creating the frostbite icon. Pokemon Shuffle 3DS UI redesign: Area Navigation - In Pokemon Shuffle the only way to get around the map is to tap the arrows in the upper left and right of the touch screen or manually swiping left or right. There are 15 areas and counting, which means 15 taps with scrolling animation to get from one end to the other, or at least 10 seconds of manual swiping. It's a pain to get to specific levels. Solution: When the player taps the name of the area in the upper left corner (2), both screens dim while a scrolling navigation bar appears with little icons for each area (1). 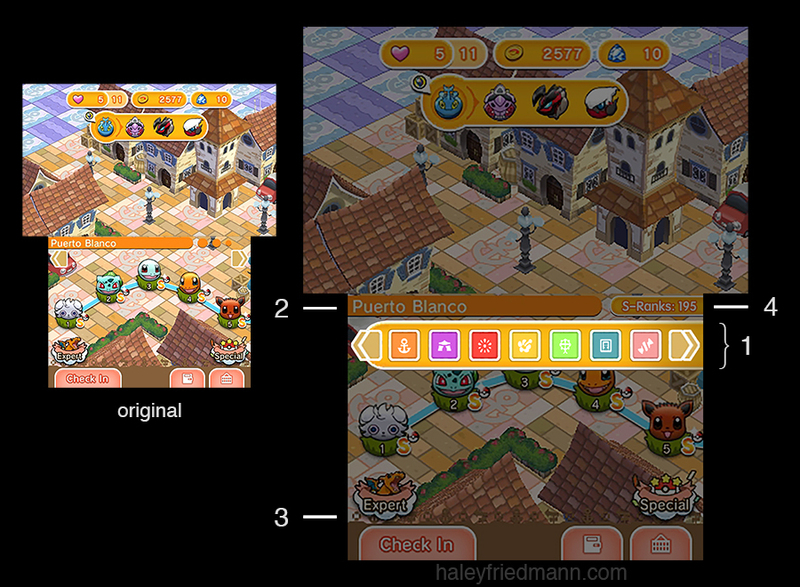 The icons' colors match the respective background colors of the area names (2), forming an easy link in the player's mind. To give more information about the area the icon relates to, I've matched a white shape to one of the shapes unique to each area that makes up the lower border of the touch screen (3). As soon as a player taps an area icon that area appears on the screen, the scroll navigation bar disappears, and both screen brighten again. This brings the taps down to get to almost any area to 3! Bonus issue - Currently the only way a player can know how many stages they have scored an S on is to manually count them. S ranks unlock special stages which are very important to players, so an easy way to keep track is sorely needed. Solution: I put a little counter in the upper right corner of the touch screen while in the map screen (4). Headache solved! 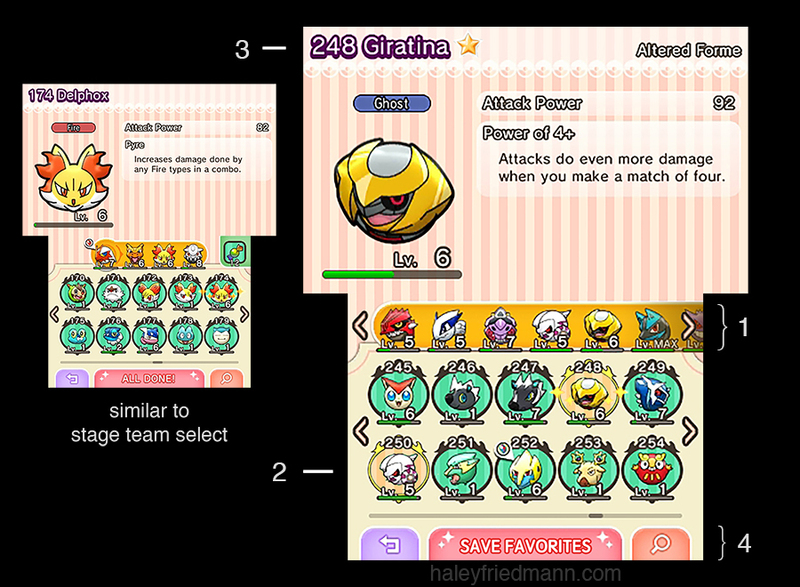 Pokemon Shuffle 3DS UI redesign: Stage Team Selection - Players don't use most of the Pokemon they catch, they use a specific few over and over and they need quick access to them when they are building teams. Currently players have two options for team building: tapping the Optimize button which randomly puts together different combinations of the player's strongest super effective Pokemon, or going into the Pokedex to muddle through hundreds of monsters to find the specific ones they're after. Solution: I've given the player 95% of the Pokemon they would have searched out right here in the Stage Team Selection screen. Players can now drag and drop from a two page Favorites box they've selected themselves of their most used Pokemon (1). I've also introduced the option of 3 Saved Teams they've premade themselves (2). Most likely a player would use Saved Team slots for commonly used strategies like coin grinding teams or special ability combination teams that are annoying to put together over and over again. Here all a player has to do is tap a Saved Team and their current team will match it. For less picky players the Optomize button is still there (3), and if all else fails players can go into the Pokedex (4). 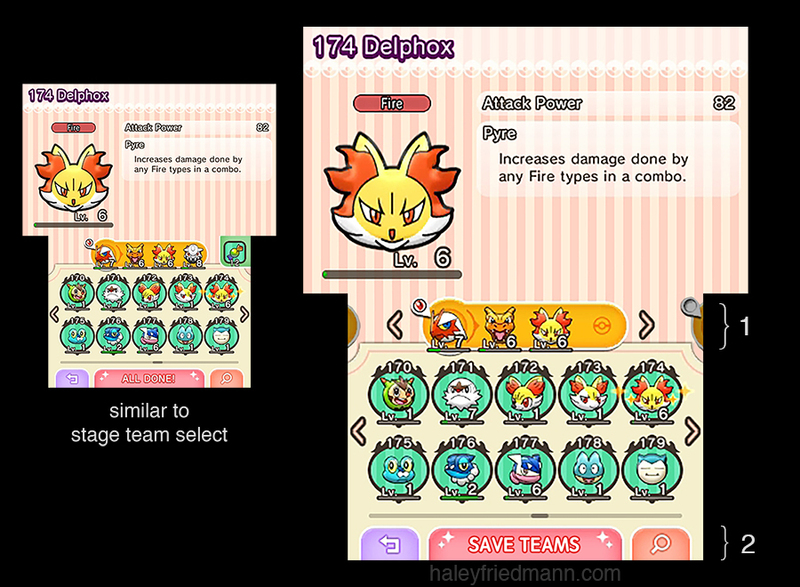 Pokemon Shuffle 3DS UI redesign: Saved Teams - The way a player would create Saved Teams is very similar to the normal team creation process for stages. Players drag and drop Pokemon into the team at the top of the touch screen (1), arranging them as they wish. The player can switch back and forth using the top arrows between 3 Saved Teams and update one or all of them in one session. The player saves the teams and returns to the main menu by tapping Save Teams (2). 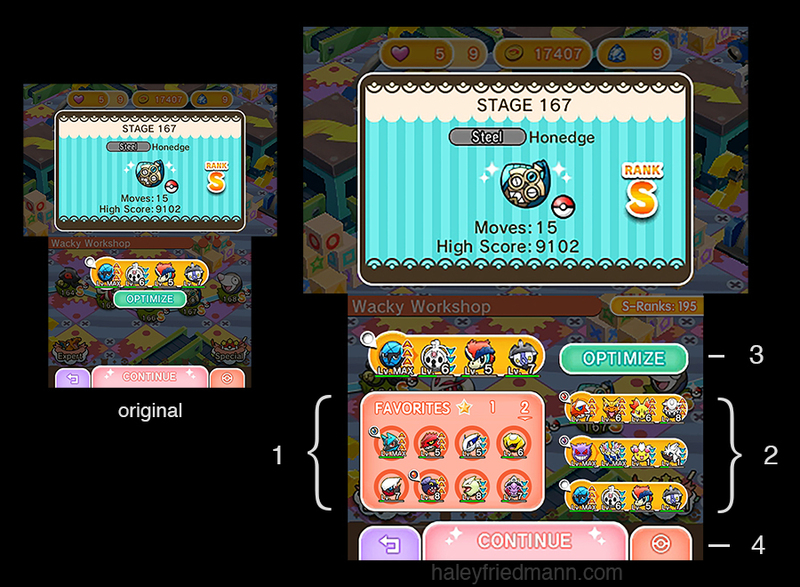 Pokemon Shuffle 3DS UI redesign: Favorites Selection - Also similar to the normal team creation process for stages, but here a player can drag and drop up to 16 different Pokemon in the upper box (1). Favorited Pokemon get a bright golden border, a pale golden/orange background (2), and a star next to their name in the upper screen (3). The Favorites box is navigated through manual swiping or tapping the top arrows. The player saves their Favorites and returns to the main menu by tapping Save Favorites (4). 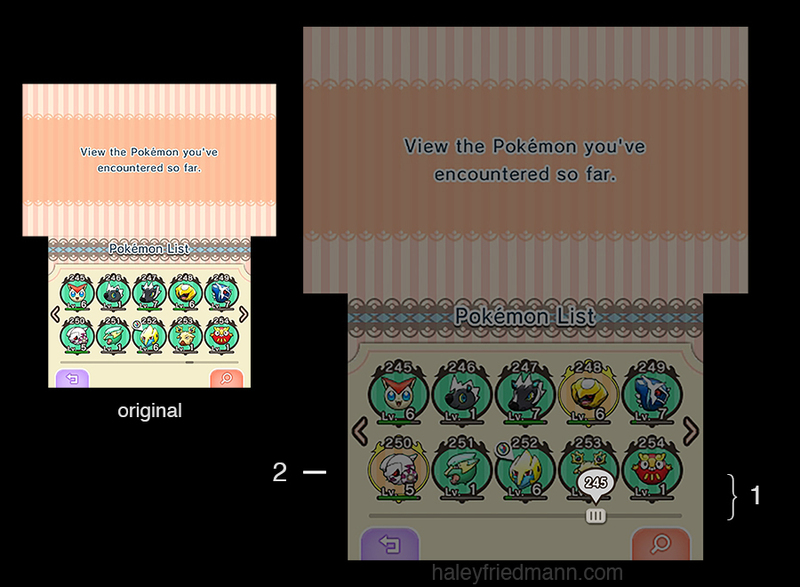 Pokemon Shuffle 3DS UI redesign: Pokedex Navigation - A very similar problem to the map navigation, but even worse. The Pokedex can only be navigated by tapping the arrows which slides pokemon along at 10 at a time, or by manual scrolling. The little scrollbar at the bottom is untouchable. At 353 Pokemon in the game so far, that takes an absurd 35 taps to get from one end of the Pokedex to the other. 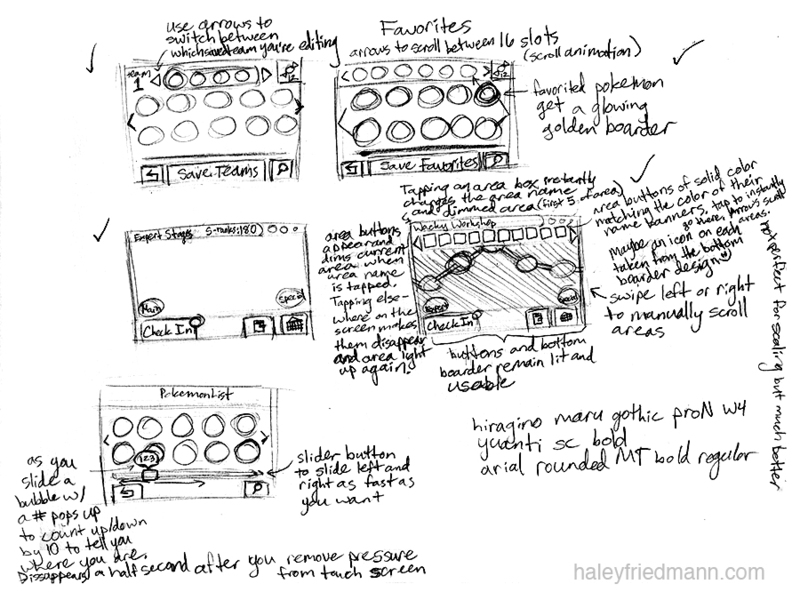 A page from my sketchbook of scribbles and notes working out how to redesign the Pokemon Shuffle UI for the 3DS. 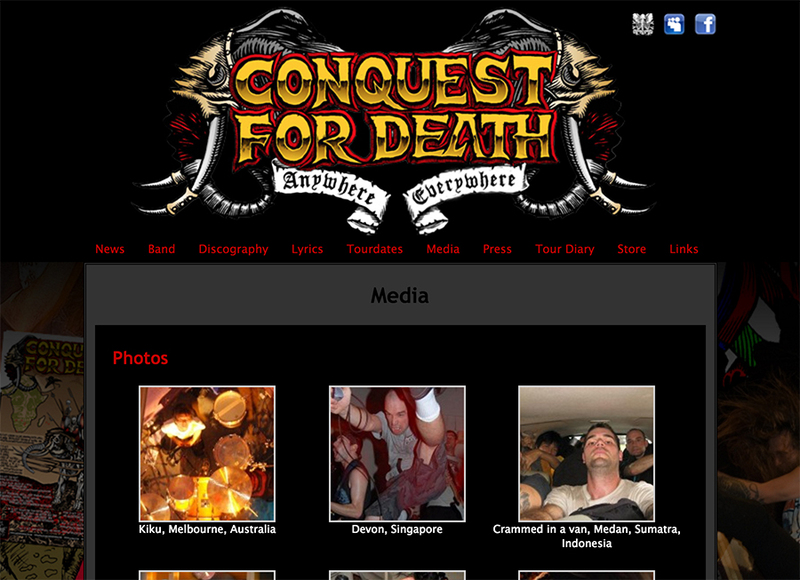 Website created for the legendary Bay Area Thrash band Conquest for Death! - Not pictured: I had to simplify the backend so the band could post to the site themselves. Pleased to say it worked and they post regularly. 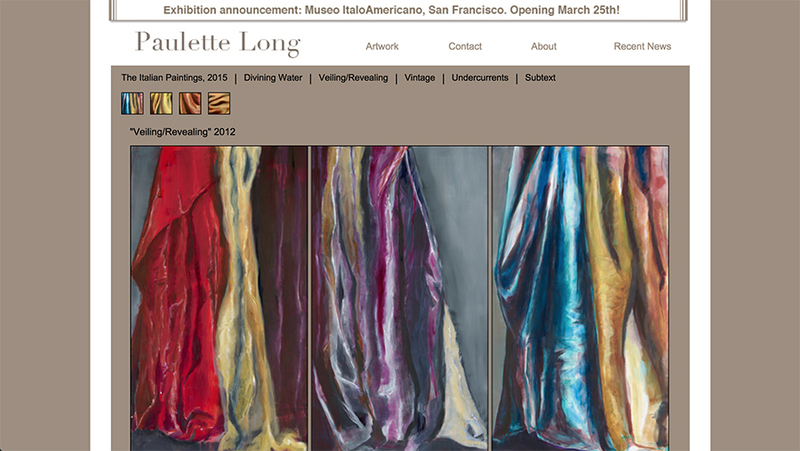 Website created for Bay Area painter Paulette Long - She is a wonderfully prolific artist who wanted to showcase numerous collections of her work on her site. My solution was to create a dropdown menu in the main navigation to select work by medium, and then have subnavigaiton for the different collections take up minimal space above the work. Below that, clickable thumbnails for individual works of the current collection are shown. It was a lot to pack in, but users can access any of the 100+ organized images on the site within 3 clicks, no matter where on the site they are.